If there were ever a novel that had some divine inspiration behind it, I think this must be it. Les Miserables paints an amazing picture of the human condition, the power of Grace over the Law, and the transformative power of love. The characters are believable, well-developed, endearing, and fascinating on a number of different levels. I really, really loved this book. At nearly 1800 pages, this novel isn't for the faint of heart. Hugo frequently deviates from the main plot line to give you extensive background information that, while educational, isn't exactly essential to the progress of the story. However, overall, it does give one a good sense of the social and political dynamics of France during that time period, which gives the main plot a very believable and vivid backdrop. 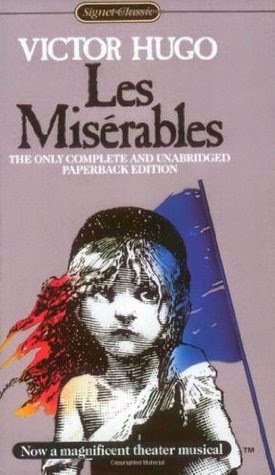 I'd also like to add that the Broadway musical and some of the film adaptations of Les Miserables are as much masterpieces as the novel, which can't often be said. 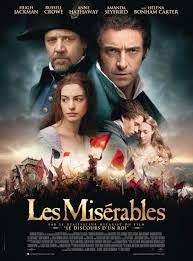 My personal favorite is the recent musical film version starring Hugh Jackman. If you don't feel up to tackling the entire novel, this film does an excellent job of capturing its essence. I highly recommend adding this to your reading list! "Sometimes he dug in his garden; again, he read or wrote. He had but one word for both these kinds of toil; he called them gardening. 'The mind is a garden,' said he." "'The beautiful is as useful as the useful.' He added after a pause, 'More so, perhaps.'" "'Let us never fear robbers nor murderers. Those are dangers from without, petty dangers. Let us fear ourselves. Prejudices are the real robbers; vices are the real murderers. The great dangers lie within ourselves. What matters it what threatens our head or our purse! Let us think only of that which threatens our soul.' Then, turning to his sister: 'Sister, never a precaution on the part of the priest, against his fellow man. That which his fellow does, God permits. Let us confine ourselves to prayer, when we think that a danger is approaching us. Let us pray, not for ourselves, but that our brother may not fall into sin on our account.'" "'This is not my house; it is the house of Jesus Christ. This door does not demand of him who enters whether he has a name, but whether he has a grief.'" "That which was certain, that which he did not doubt, was that he was no longer the same man, that everything about him was changed, that it was no longer in his power to make it as though the Bishop had not spoken to him and had not touched him." "She who wishes to remain virtuous must not have pity on her hands." "Children at that age are only copies of their mother. The size is smaller; that is all." "The supreme happiness of life consists in the conviction that one is loved; love for one's own sake - let us say rather, loved in spite of one's self; this conviction the blind man possesses." "There is no one for spying on people's actions like those who are not concerned in them." "Certain persons are malicious solely through a necessity for talking." "Misery offers; society accepts. The sacred law of Jesus Christ governs our civilization, but it does not, as yet, permeate it; it is said that slavery has disappeared from European civilization. This is a mistake. It still exists; but it weighs only upon the woman, and it is called prostitution. It weighs upon the woman, that is to say, upon grace, weakness, beauty, maternity. This is not one of the least of man's disgraces." "To lie is the absolute form of evil. To lie a little is not possible: he who lies, lies the whole lie." "He recognized the fact that one of these ideas was, necessarily, good, while the other might become bad; that the first was self-devotion, and that the other was personality; that the one said, my neighbor, and that the other said, myself; that one emanated from the light, and the other from darkness." "The highest holiness is to think of others." "...the whole crowd, as by a sort of electric revelation, understood instantly and at a single glance the simple and magnificent history of a man who was delivering himself up so that another man might not be condemned in his stead." "Fortunately, God knows where to find the soul again." "Blind is he who will not see!" "He suffered all the pangs of a mother, and he know not what it meant; for that great and singular movement of a heart which begins to love is a very obscure and a very sweet thing. Poor old man, with a perfectly new heart!" "He trusted in God, as she [Cosette] trusted in him. It seemed as though he also were clinging to the hand of some one greater than himself; he thought he felt a being leading him, though invisible." "On the first goblet this inscription could be read, monkey wine; on the second, lion wine; on the third, sheep wine; on the fourth, hog wine. These four legends express the four stages descended by the drunkard; the first, intoxication, which enlivens; the second, that which irritates; the third, that which dulls; and the fourth, that which brutalizes." "This book is a drama, whose leading personage is the Infinite. Man is the second." "What a contemplation for the mind, and what endless food for thought, is the reverberation of God upon the human wall!" "The peculiar property of truth is never to commit excesses." "There is, as we know, a philosophy which denies the infinite. There is also a philosophy, pathologically classified, which denies the sun; this philosophy is called blindness. To erect a sense which we lack into a source of truth, is a fine blind man's self-sufficiency. The curious thing is the haughty, superior, and compassionate airs which this groping philosophy assumes towards the philosophy which beholds God. One fancies he hears a mole crying, 'I pity them with their sun!'" "The negation of the infinite leads straight to nihilism." "A smile is the same as sunshine; it banishes winter from the human countenance." "He was one of those children most deserving of pity, among all, one of those who have father and mother, and who are orphans nevertheless." "Theodule was the favorite of Aunt Gillenormand, who preferred him because she did not see him. Not seeing people permits one to attribute to them all possible perfections." "A skeptic who adheres to a believer is as simple as the law of complementary colors. That which we lack attracts us." "And sarcasms, sallies, jests, that French thing which is called entrain, and that English thing which is called humor, good and bad taste, good and bad reasons, all the wild pyrotechnics of dialogue, mounting together and crossing from all points of the room, produced a sort of merry bombardment over their heads." "He took good care not to become useless; having books did not prevent his reading, being a botanist did not prevent his being a gardener." "And then should not the charity be all the more profound, in proportion as the fall is great?" "Communism and agrarian law think that they solve the second problem. They are mistaken. Their division kills production. Equal partition abolishes emulation; and consequently labor. It is a partition made by the butcher, which kills that which it divides." "If there is anything more heart-breaking than a body perishing for lack of bread, it is a soul which is dying from hunger for the light." "Love has no middle course; it either ruins or it saves." "Of all the things that God has made, the human heart is the one which sheds the most light, alas! and the most darkness." "'You've got the sniffles, old lady,' said Gavroche. 'Blow your promontory.'" "Nothing is more natural to drunken men than ellipses. The ellipsis is the zig-zag of the phrase." "'Ah, by the way, Laigle of the funeral oration, your coat is old.' 'I should hope so,' retorted Laigle. 'That's why we get on so well together, my coat and I. It has acquired all my folds, it does not bind me anywhere, it is moulded on my deformities, it falls in with all my movements, I am only conscious of it because it keeps me warm. Old coats are just like old friends.'" "Here is the Spring presenting arms and in full uniform." "When grace is mingled with wrinkles, it is adorable. There is an indescribable aurora in beaming old age." "Everything can be parodied, even parody." "If people did not love each other, I really do not see what use there would be in having any springtime." "To love, or to have loved, -- this suffices." "It is not enough to be happy, one must be content." "It is a terrible thing to be happy! How content one is! How all-sufficient one finds it! How, being in possession of the false object of life, happiness, one forgets the true object, duty!"